New Doctor Who games pit the Doctor and Amy against their deadliest foes on the DS and Wii. With so much intersection between Doctor Who fans and gamers, it is frankly amazing that we haven't been drowned in licensed Who games for years. The show makers at BBC seem eager to finally change this fact. With two PC adventure episodes under its belt and a third on the way, the network has also announced that new Doctor Who adventures are on the way for the DS and Wii. The DS game is entitled Doctor Who: Evacuation Earth, and the Wii release will be called Doctor Who: Return to Earth. 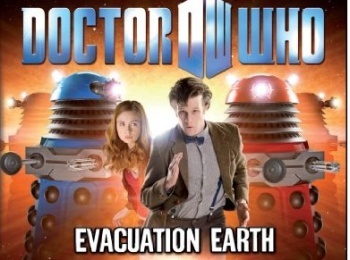 Both games take place during the latest season of the show, with Evacuation Earth revolving around an attack by the deadly Daleks. Return to Earth, which presumably is a follow-up to the DS game, features the robotic Cybermen. The story of both games is being written with the help of the show's production team, and you will be able to play as both the Doctor and his human companion, Amy. The two titles are being developed by Asylum Entertainment, a British studio responsible for a number of children's titles and licensed games. The studio's portfolio is of mixed quality, but it does have some Doctor Who experience - several members of Asylum's team previously worked on the 1998 PC game Destiny of the Doctors. Both games are slated for release on October 29th in the UK and Australia. The odds of a US release are slightly lower than the PC adventures, due to the cost involved in finding a publisher and printing physical media, but fans outside Britain can still grab the games through Amazon UK.